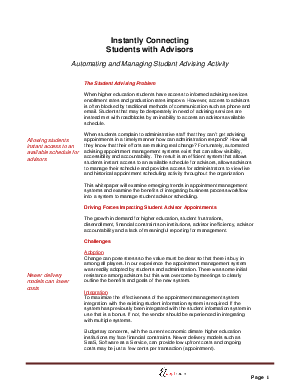 When students complain to administrative staff that they can't get advising appointments in a timely manner how can administration respond? How will they know that their efforts are making real change? Fortunately, automated advising appointment management systems exist that can allow visibility, accessibility and accountability. The result is an efficient system that allows students instant access to an available schedule for advisors, allows advisors to manage their schedule and provides access for administrators to view live and historical appointment scheduling activity throughout the organization.